Gabriela Mazepa is a Brazilian designer, founder and creative director of Re-Roupa. She was the winner of British Council Fashion Awards in 2009, representing Brasil in England. Today, apart from designing her collections and working on her social projects, she's part of the movement Roupa Livre, is the Brazilian ambassador of Fashion Revolution and works at the creative atelier Rede Asta. YOU HAVE HAD A VERY INTERESTING JOURNEY, PROFESSIONALLY AND PERSONALLY. CAN YOU TELL US A LITTLE BIT OF WHAT BROUGHT YOU HERE NOW? I‘ve always known that I somehow would work with something art-related, as I was exposed to it from a very early age. I’ve studied classical and modern dance since I was 7 years old, and got a professional license when I was 17. At university, I studied Architecture and later on switched to Textiles, in an Art School in France, where I graduated. These three paths complemented each other and brought me to where I am today, doing what I do. Beyond aesthetics, the art of dancing as well as architecture, teach you how to be aware of others, others’ spaces and how to relate with people, which is crucial to what I do. WHAT IS RE-ROUPA AND HOW WAS THE PROJECT BORN? I like to say that it’s a project, a methodology and not only a brand of clothing. Even though we sell clothes (all made with upcycled material), the main intention of the project is to focus on how these clothes get made. And this process is a service that Re-Roupa offers with consultancy, classes, workshops. I believe that the fashion industry produces, and produced until now, in great excess – and all of it's left overs (tons of fabrics every day) can be used as raw materials for us to create new pieces, and also to teach people new ways of production. Everything we do here is done in partnership with coops and communities, generating income to those in socially vulnerable situations. For us, this process is much greater than the actual piece sold at the end. YOU WERE AHEAD OF THE GAME, WHEN ENVIRONMENTAL ISSUES WERE NOT YET A TREND, AND PEOPLE WEREN'T REALLY AWARE OF THE WHOLE "BEING GREEN" CONCEPT. BESIDES RE-ROUPA WHAT ARE SOME OF THE THINGS YOU DO ON AN EVERYDAY BASIS THAT CONTRIBUTE TO THAT WAY OF LIVING? I grew up in a city (Curitiba, Brasil) that educated us on recycling since I was a kid, so this is very normal to me. But unfortunately recycling at home doesn’t really make a difference if the neighborhood doesn’t, the city doesn’t or the state doesn’t invest on it. It’s a very complex matter. I don’t own a car and actually encourage the use of public transportation in a city awfully overpopulated with cars like São Paulo. I didn’t eat meat for years, not the case anymore, but I try to maintain healthy eating habits, as much as possible. I try to look at consumption, for example, as a way to support initiatives that I find relevant. In SP I buy food from a local place in my neighborhood that sells products directly from the producer and you pay for a contribution fee if you want. You know who planted and especially that its organic, etc. I do understand though, that this is a privilege, because even though I dedicate most of my time to social and environmental causes, I'm not the type of person that judges others for buying this or that. Brasil is a very unequal country, where people consume what they can pay for, and obviously these wont be your best-for-the-environment options. CAN YOU RECALL SOME OF THE MOST IMPORTANT MOMENTS IN YOUR CAREER? There were so many, I’m a very fulfilled person in terms of career. But I think that since last year things have been getting more consolidated and I’ve been working in the big projects I really wanted to. Going to Sri Lanka to work with a group of survivor women from the civil war for example, super talented artisans, was maybe one of the greatest moments I’ll mention forever. Opening an atelier/store in SP, where I live now, has also been an amazing adventure. WHAT HAS BEEN THE PROJECT YOU'RE MOST PROUD OF? Parallel to Re-Roupa (and also complementary to it) I work as a fashion designer in a social project called Rede Asta. 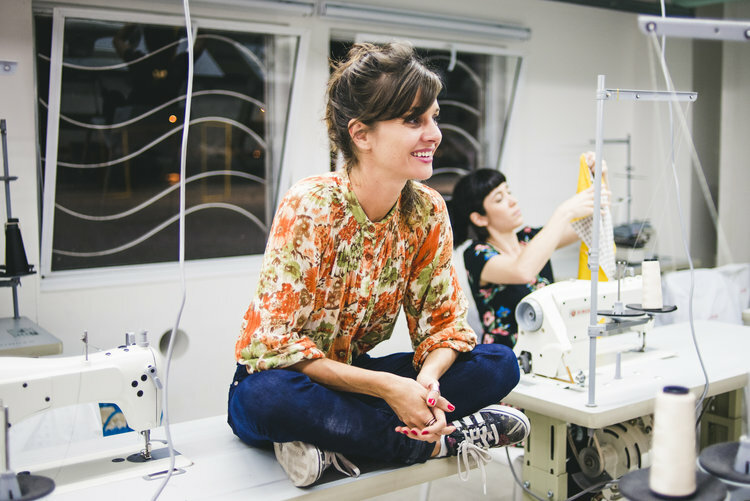 This movement was created specifically to generate income to artisans and seamstresses in Brasil and beyond. I’ve developed collections (clothing, accessories, objects) with these groups and feel very proud of the work we’ve done together. WHAT AND WHO ARE THE BIGGEST INFLUENCES IN YOUR LIFE? My parents influenced me a huge deal, especially in my professional path. I’ve only come to realize this much later, when it was clear to me that what I did was difficult to label (and that this was one of the biggest pros of it). The people who I work with in social projects in general, specially the women. I always leave inspired and a better person, every time we meet. The financial part. To charge for things that aren’t necessarily in the market, it makes it difficult to bench mark. SOMETHING YOU DO OFTEN THAT BRINGS YOU JOY? That I eat much more than it seems, lol, and that im always thinking about my next snack. Getting in the ocean...is there a name for that? It was such a crazy trajectory. I think each bump was very important so I don’t think I would change a thing. To prove to men, through history, that we live in a world of machismo. And this has to change. IF YOU COULD SEND A NOTE TO YOUR 25 YEAR OLD SELF? Spend some time studying finance! WANT TO KNOW MORE ABOUT GABRIELA/ RE-ROUPA?